The conception and birth of a child is a miraculous event – and let’s not candy coat it – birthing a baby is a painful event. A women’s body is a temple and should be treated as such. Honor your post-baby body; allow it ample time to rest, and be thoughtful on how you return to exercise. New moms are committed to losing baby weight faster than ever, but doing too much too soon can cause more harm than good. The physical changes that occur to a woman’s body after childbirth can vary from individual to individual. Here are five changes to be aware of and suggestions on how to navigate them. 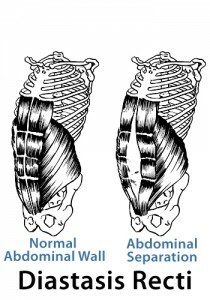 Abdominal wall muscles are overstretched during pregnancy. Ideally you would perform moves to shorten these muscles to stimulate muscle memory, before engaging in strengthening exercises. Example of shortening exercises include: pelvic tilts, deep breathing, and heal slides. Hormonal effects, such as joint laxity, can be present up to 16 weeks postpartum (longer if you are nursing). It is recommended to gradually progress into higher impact activities such as running NO LESS than twelve weeks postpartum. Listen to your body while exercising. If what you are doing doesn’t feel good, avoid pushing through it. “No pain, no gain” is NOT applicable to a post-baby body. During pregnancy, your center of gravity shifts forward deepening the “S” curve in your spine. Your goal is to gradually return the spine to its pre-pregnancy alignment, which helps to prevent future back pain and injuries. Being conscience of your posture, and adding gentle back stretches and exercises to your exercise program will help facilitate body alignment. Diastasis may occur during pregnancy or during delivery. 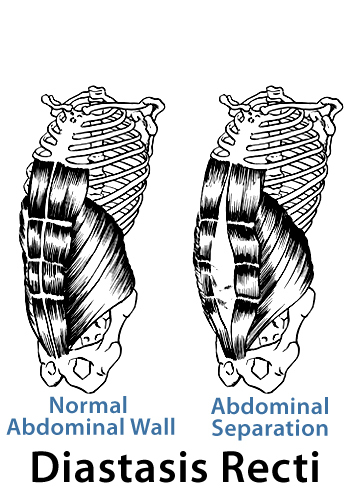 It is a condition in which the two large parallel bands of muscles that meet in the middle of the abdomen separate. It doesn’t hurt, and you may not even be aware that it exists. It’s important to check, a separation may lead to increased low back pain, pelvic instability, urinary leakage, or reduced functional strength of the abdominal wall. There are specific exercises that can be prescribed to help mend the separation. The pelvic floor muscles are the main muscle group responsible for pushing your baby out during delivery. They undergo extreme stretching during a vaginal birth, but they also undergo constant stress during the last few months of pregnancy supporting the weight of the uterus and baby. Practice pelvic floor exercises (also known as ‘Kegels’) as soon as possible to help restore muscle memory. Sorry to report mommas, suturing will not restore the function of the pelvic floor. Weakened pelvic floor muscles may cause urinary incontinence, lower back pain, and other related issues. These are a just a few physical changes your body is adjusting from post baby. When you are ready to return to exercise, be kind to your body. Listen to the small aches and pains. Ask your healthcare provider to check for diastasis. Consider physical therapy if you had a cesarean section – it is major abdominal surgery. Know that urinary leakage a few months after childbirth is not normal. Seek out experienced prenatal / postnatal fitness professionals, like the trainers at Active Moms’ Club, to help you navigate safely and effectively back into exercise. AMC’s “From the Core: Postnatal Recovery” class and Post-Baby Body Express Training addresses all of these changes and provides professional guidance for new – or experienced – moms. 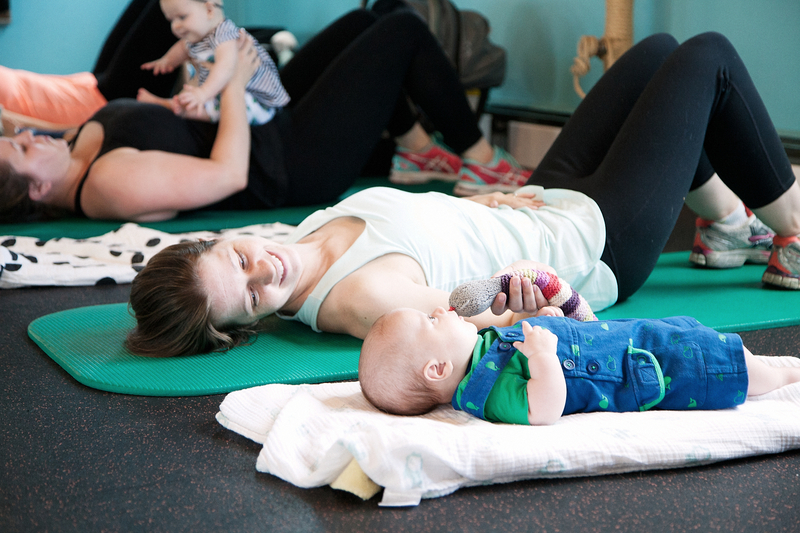 If you are a Chicago mom and need more guidance in your postpartum workout routine visit our website to learn more about our classes and personal training.